I came to the Banh Mi late in life (as I imagine most Brooklyn Jews did), but when I fell for it, I fell hard. The general idea, at least in the vegan versions I’ve tasted, is charred meat (seitan and tofu most often), super spicy creamy spread, pickled veggies to help cool you down, and the fresh cilantro and mint just make the whole thing. Since Banh Mi by definition calls for bread, this is a very deconstructed version, but you could easily reconstruct this baby and serve it on a good, chewy baguette, just leave out the lettuce. For me, right now it’s 100 degrees outside and I want salad! I decided to use shiitakes as my meat, first of all because I’ve never seen anyone else do it but also because I wanted something relatively light but still entirely meaty. I love the hot/cold contrast in salads and this one doesn’t disappoint. 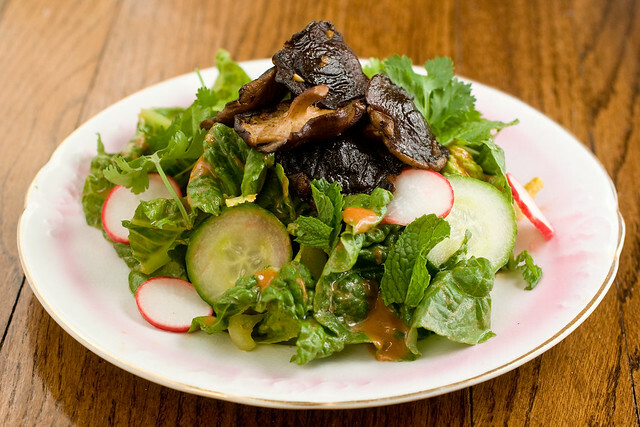 The crisp, flavorful salad, coated in a simple spicy almond butter dressing, with the sweetness and acid from the pickled veggies, up against the charred, juicy, salty shiitakes stir up emotions in me that a salad probably shouldn’t. If you’ve never pickled anything before, you’ll feel a great sense of accomplishment pickling your first veggies in this recipe! And don’t worry, it’s the simplest thing in the world, you just throw some vinegar and sugar in a bowl, stir, and toss in the veggies for an hour or so. Despite all of the components, the recipe is really, really easy. Stir together the rice vinegar, sugar and a pinch of salt. Toss in the radishes and cucumbers to coat. Let them rest for about an hour, giving them a stir with your hands every so often. Mix together almond butter, 3 tablespoons of liquid from the pickles you just made, Siracha, 1 tablespoon water and a pinch of salt. Since almond butter varies from brand to brand, you may need a little more water to thin it out enough to coat the salad. You may also want to use more Sriracha, I actually used an extra teaspoon for a bit more spiciness, but it depends on your taste. Preheat a large cast iron pan (or any heavy bottomed pan) over medium-high heat. Drizzle in the oil, then add the shiitakes. Cover and let the shiitakes cook for about 5 minutes, stirring occasionally. They should be softening up a bit and releasing moisture. Now uncover, and cook for 3 more minutes or so, until they are slightly browned in spots. Add the garlic and saute a minute more. Lastly, add the splash of soy sauce, and stir until it’s well incorporated. Toss the greens with the dressing to coat. Plate the greens and top with the pickled veggies. Throw some herbs on top, and finish with the shiitakes. Serve immediately. The perfect way to use up those shiitakes in my fridge. Yay! MMM- I have some do chua left(pickled carrot & daikon) over from making banh mi a few weeks ago & this would be a great way to use it up, especially since there’s fresh mint in the garden right now. Thanks for the idea. Wow! I love the flavours of banh mi, and this salad sounds terrific! I have a full folder of food blogs in my favorites, but this particular recipe is going into the folder of individual recipes I want to make. Having lived and worked in Cambodia for seven years not long ago, we made several trips to Vietnam, where we enjoyed bahn mi more than a few times, served with noodles (a fish option; before vegan days); a simple yet stunningly delicious and elegant dish. So nice that you honor it here, and so creatively. Thanks! Forgot to say, the bahn mi with noodles was in Hanoi (regional variation), and I think in Ho Chi Minh City, or south, it was served in baguettes, as you mentioned. With respect, Chandra, this has little resemblance to a banh mi. Pickled veggies more appropriate would be carrot and daikon. And where’s your protein, lady? You’re always SO good about that– tofu is the essential banh mi protein. I get it’s an interpretation, but I will argue it’s more a generally “Asian-inspired” recipe than anything even remotely related to the classic, delicious, and often vegan Vietnamese sandwich. It’s my take on it, I don’t know what to tell you! It tastes like a deconstructed Banh Mi, and Banh Mi is what inspired it. I know that daikon is more common, but I pickled the veggies that I had on hand and clearly the shiitakes are my “protein,” I even wrote why right in the recipe. Feel free to come up with your own interpretation! what is almond butter? I never heard about it. Is it one of these “American things” I can’t get here in good old Europe? Omg. My wife and I made a version of this as a slider (now named the bang mi slider thanks to iPhone autocorrect) and it was maybe the best thing I have ever eaten. Added veganaise to the dressing to make it spreadable and put everything on grilled flatbread. http://instagr.am/p/FoYGu Absolutely delicious. Thanks so much, Isa! I really want to make this but my hubby is allergic to almonds….what butter should I use instead? No hazelnuts either btw. Thanks! Yum, this salad was delicious. I love how easily the dressing is whipped up without the food processor. My only problem is that I could have eaten all of the mushrooms in one sitting. Mmm, shiitakes. p.s. You could use peanut butter but the natural style would work better than any of the thick conventional types. Thank you for this!!! I used the cashew butter and was eating that dressing by the spoonful last night. I should be disgusted by my behavior but whatever. This recipe is insanely easy and delicious! Thank you Isa. Had a banh mi sandwich for dinner last night. It was good…but makes me want to make this much healthier version at home! I made this tonite on a sub to pump it up and it was great. I used natural peanut butter-almond butter was 10 dollars for a jar! Craziness! peanut butter worked fine. Cindy – if you’re near a Trader Joes, get your almond butter there. Much less expensive. What do you mean by sugar sugar? Can i use raw turbinado sugar? Hey Martha, thanks for the tip! I never tried shiitakes….it is odd for you?! This looks amazing! Can’t wait to try it. Thanks 🙂 BTW Blue Diamond makes almond butter you can find pretty easily in a regular supermarket and it’s not crazy expensive. Check also health food stores for almond butter in bulk. Help me ladies- what is sriracha? Sriracha is a HongKong chili sauce. You can get it at Whole Foods and probably elsewhere. The brand I have is Lee Kum Kee and it is produced in the USA. Whoa, I a little bit love you for this. I used to live in what was basically a suburban version of Chinatown and occasionally used to subsist entirely off Banh Mi. Not the healthiest habit, but now I can just replace one addiction with a better one ! Awesome! I would like to preface by saying you have a lot of great recipes on here, but as a Vietnamese-American, I’m having a really hard time understanding how this is at all related to a Banh mi. This is just a shiitake salad. Thanks! I tried to explain how it’s related in the intro to the recipe. Banh mi was my inspiration. I arrived here because I was looking for some recipe with shiitakes, since it’s the only type of mushrooms my husband likes. Well I’ve made this salad yesterday and I can just say that I loved it! I will definitely make it again! Loved this recipe! The 2nd time I made it I added some rice noodles to make it into more of a dinner dish. It tasted great both ways! This looks delicious I think I will make it today! A note about almond butter if anyone is interested… I’ve found that I can make my own with just a regular food processor by first toasting the almonds, then pulsing them in the food processor until they look like almond flour, adding some almond oil and a sprinkle of salt and then processing until smooth. It tastes sooo much better than store bought and I think it’s more economic if you get a good price on bulk almonds. The same method works great with walnuts and other nuts although walnuts don’t need the extra oil. Bahn Mi Salad | Cynthia, any witty suggestions? just made this for lunch! my only modification was that i added carrots to the pickled veggies. if i made it again i’d also double up on the mushrooms. so good!! The firstline makes Banh Mi sound a lot like some of the drugs I used to do. Really like the recipe. thanks! 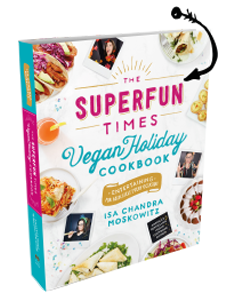 I recently bought Isa does it and made the sandwich version of this recipe oh my got it was delicious and you are a vegan genius lol. So far every recipe I’ve tried in the book have been great! This one was amazing and filling without feeling weighed down. I track my calories in mfp and saw how many calories it was in total whoa! Its definitely going to be my guilty pleasure cheat food. Next Tim I’m going to use less peanut oil and put it in a pocket pita or maybe a wrap that would be good too. Any who thanks for all the awesome recipes I’m looking forward to whatever book comes next! it is unprecedented to confront a web log each every once in a while that won’t perpetually the indistinguishable obsolete reiterated materials. exceptional output.